It’s officially 2018 and many of you are probably setting and working on some new years resolutions – many revolving around fitness and health. I usually try to set a few resolutions in the new year, one for my health and one for my business. This year I’ve decided to make my health New Years Resolution all about drinking more water! I know it’s something I can certainly do better at, probably as well as many of you. I’ve always found the 8 glasses of water pretty unreasonable. I know that is how much most of us should be drinking (or more!) but I mean, maybe if I’m doing some pretty tough physical labor or hiking for the day I will get that, but I probably come closer to 3-4 glasses a day. Maybe 6 on a really good day. I’m actually not a big soda drinker or coffee drinker either, and I rarely keep other drinks around (unless they contain alcohol) so for most of the day my only option is pretty much water or almond milk to drink, but I STILL struggle to drink enough water throughout the day! 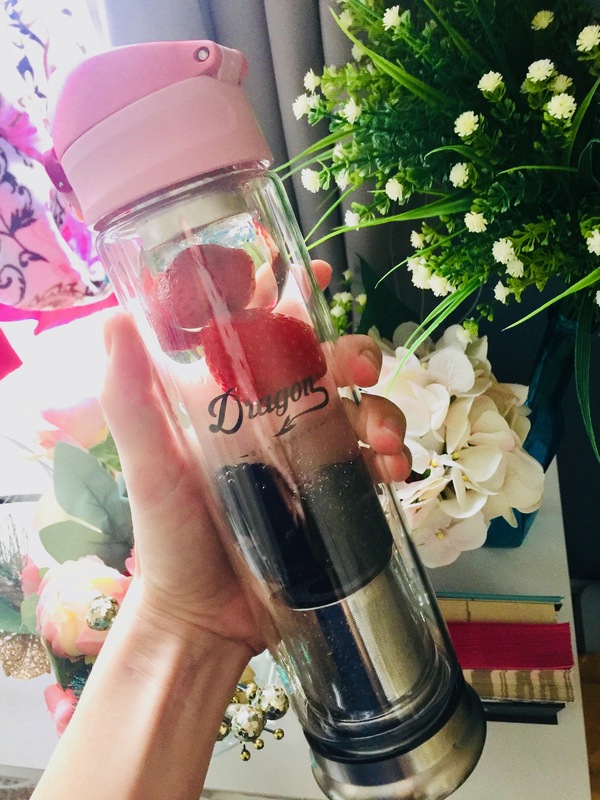 I recently came across an awesome glass infuser bottle from Dragon Glassware that lets you easily infuse your water, tea, or coffee for a yummier, tastier drink. I use mainly water in mine (thought brewing tea or coffee in it tastes great too) and infuse it with fruit. This way, it totally takes the boring-ness out of drinking plain old H2O! I can switch up my water throughout the day by adding cucumber, lemon, lime, pineapple, watermelon, berries, or any other tasty fruit for a real treat! I feel like I’m drinking yummy spa water throughout the day by doing this, and the variety of different tastes sure seems to please my taste buds too! I find myself actually (and easily!) drinking more water! This beautiful glass infuser bottle is really easy to use too! Just add fruit to the bottle, and the removable stainless steel filters at the top (there’s one at the bottom of the glass too), will keep the fruit from hitting your mouth, so you can easily sip from the pop top! It closes securely when not in use so you don’t have to worry about spills either! I love that the bottle is nice and tall but still skinny enough to fit in my car cup holder too. 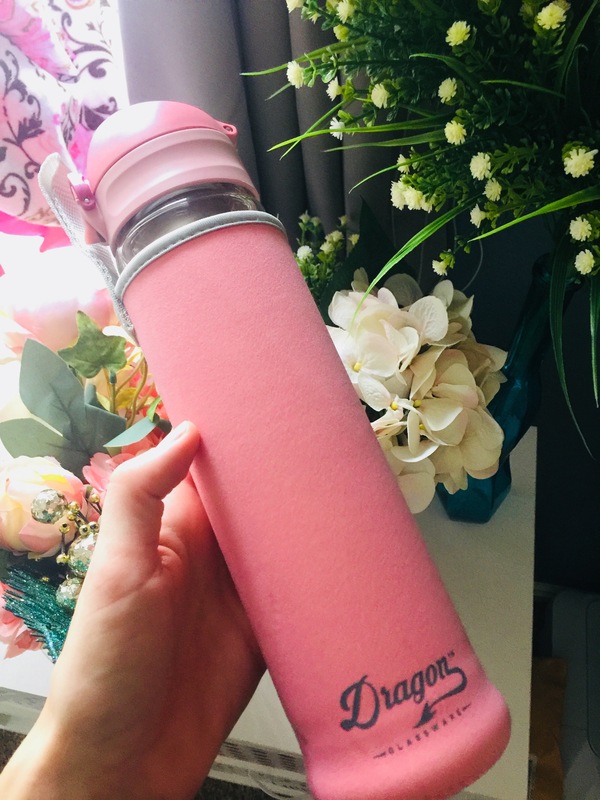 The leak-proof bottle comes in pink or black, and a matching neoprene sleeve to help protect the glass bottle as well as make gripping it so much easier! The glass is nice and thick and super high quality too. It also has a cool double-walled design for extra insulation and protection, so your hot drinks will stay warmer longer and your cold drinks will stay cooler longer too! It’s also BPA free too! 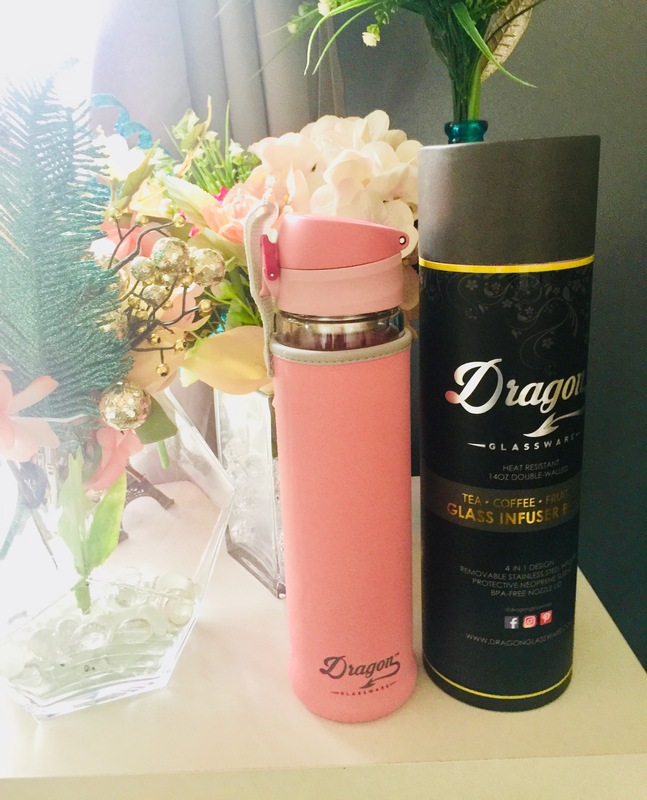 Dragon Glassware develops, designs, and manufactures high-quality handmade artisan glassware for tea, coffee, wine, spirits, and more! The glass of this infuser bottle is also thermal-shock resistant, and it’s heat-resistant and dishwasher safe too! You can easily make hot or cold coffee brews with this bottle as well as infuse loose leaf teas too! This handy infuser bottle sets itself apart by making drinking water, coffee, and tea super simplified and easy! It’s so convenient to brew your coffee, or infuse your tea and/or water and go! 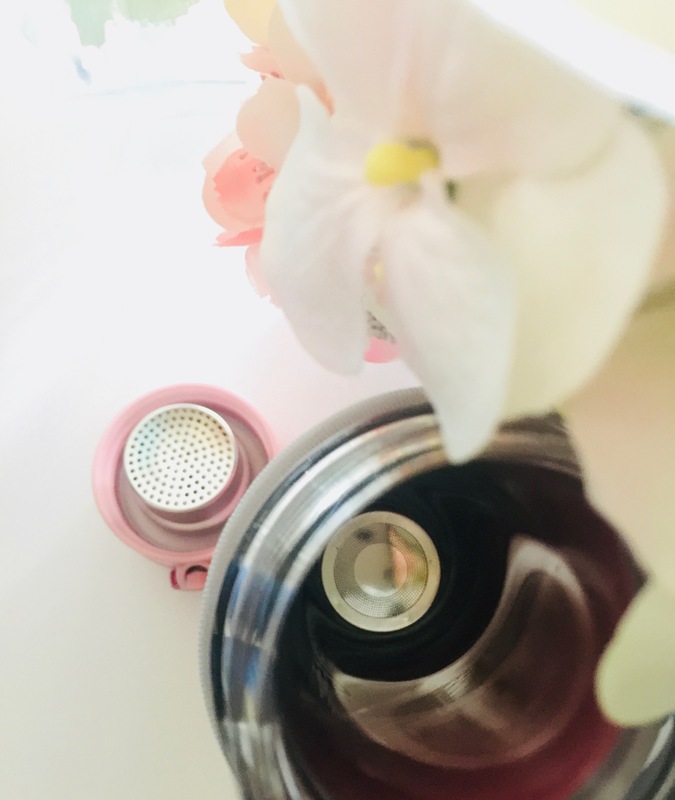 I’ve absolutely loved drinking from this beautiful, quality glass infuser bottle, and I love that it’s finally helped me drink my 8 glasses of water a day – well, just about! Interested in trying out this super handy glass infuser bottle for yourself? Check it out today Here on Amazon! Use my code: STYLEG10 and get 10% off the black infuser bottle! It also comes with some really beautiful packaging as you can see here, making it a great gift too! 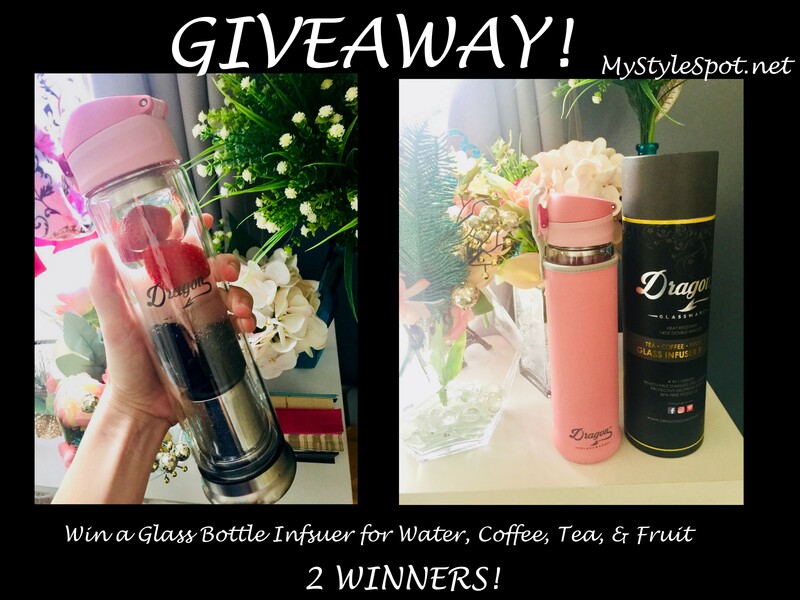 Also, the lovely people of Dragon Glassware are letting me GIVEAWAY one of their amazing glass infuser bottles to 2 of my lovely readers! Can I choose all of the above!! I pretty much live on all 3 choices lol!! That’s my life! I would use this multi-function bottle for all these things. I LOVE it!! I would use it for all three. Such a beautiful and versatile product! I would use it for all three. I would give it to my daughter, she loves tea so she would probably use it to infuse tea. I would definitely use this! Probably for water and tea.